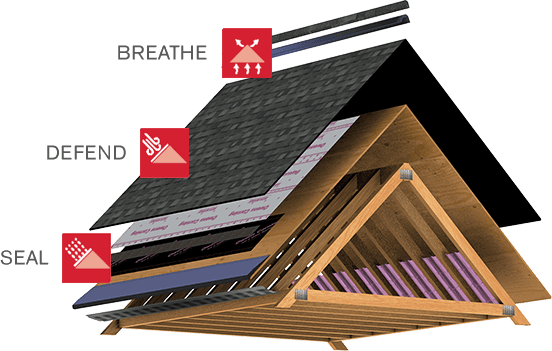 Fiberglas™ Reinforced Felt Underlayment is part of the Owens Corning® Total Protection Roofing System®^. Coverage (with 2-in. overlap) 4 sq. 2. Exception required for max use temp. 4. The surface burning characteristics of these products have been determined in accordance with UL723, ASTM E84, or CAN/ULC-S102. These standards should be used to measure and describe the properties of materials, products, or assemblies in response to heat and flame under controlled laboratory conditions and should not be used to describe or appraise the fire hazard or fire risk of materials, products or assemblies under actual fire conditions. However, the results of these tests may be used as elements of a fire risk assessment that takes into account all of the factors that are pertinent to an assessment of the fire hazard of a particular end use. Values are reported to the nearest 5 rating. Fiberglas™ Reinforced Felt is manufactured to comply with ASTM D6757 and manufactured to meet all the performance requirements of ASTM D226 and ASTM D4869, including resistance to liquid water transmission.